Oral history interview with Bill Pechet. In preparation for the 2015 online exhibit on Jewish architects. 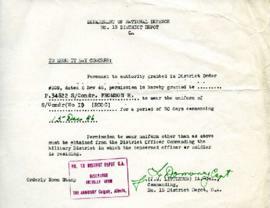 Certificate granting Ralph Fromson the right to wear the S/Condr (WI (RCOC)) uniform for 30 days commencing December 15, 1946. Oral history interview with Judah Shumiatcher. In preparation for the 2015 online exhibit on Jewish architects.